The nice people at imbcil asked me to contribute to their useless software project. Although I've created a great deal of useless software over the years, I decided to make something new for them: donkey kong sandwich. DKS is a little java application that takes a text file as input. 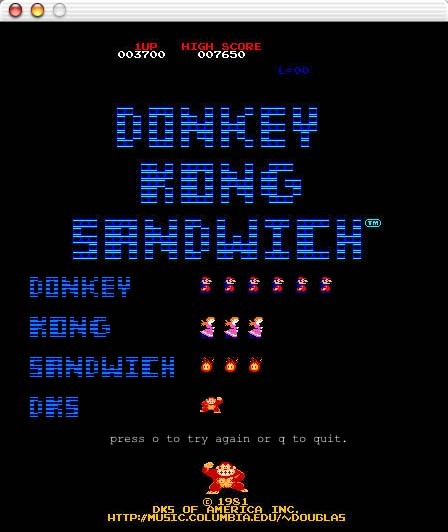 It parses that text file and counts the occurances of the words "donkey," "kong" and "sandwich," as well as the phrase "donkey kong sandwich." It displays the resulting tally using graphics elements from the classic arcade game Donkey Kong (tm).